What is ticket management system? After a customer's ticket enters your company's system, it passes through multiple points before reaching its resolution. This multiplied by hundreds of customer tickets makes a shared inbox insufficient for providing good support. Ticket management software helps you organize all your customer requests and cut through the clutter. It makes the job easier, every step of the way. What should you look for in a support ticket management tool? Multichannel support: A good ticket management tool helps bring customer communications from different channels to one interface. This reduces the amount of time your agents spend switching between tabs, and brings all customer data to one place. Email: A service ticket management system collects and brings all your customer emails to one interface. This is especially convenient when you have multiple email addresses for customer support. Social media: Time is essential while responding to customers, especially when it comes to social media. Ticketing software brings your customers' social media messages to one tab, from which your agents can view and reply to messages, and tweet out to your customers all from the same place. Learn more. Live chat: Agents can make sure customers get instant, personalized responses via live chat. 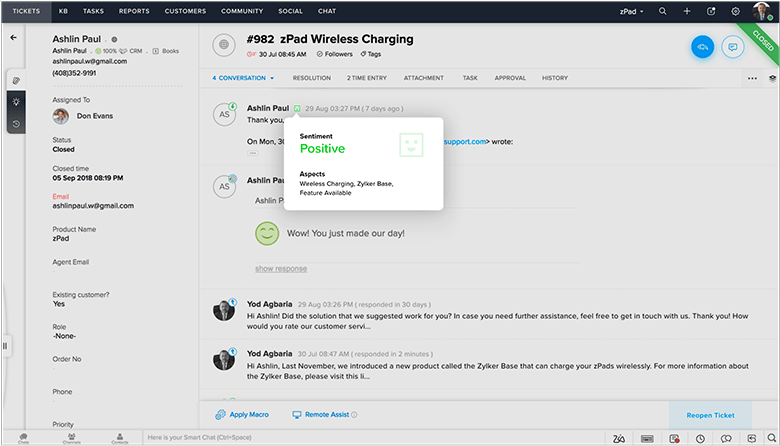 Ticket management software enables you to embed chat widgets in your website or help center from which your customers can reach out to you. Learn more. Telephony: With cloud telephony, agents can make and receive customer calls on the cloud, while recording and logging these conversations. They can also convert these calls into new tickets or associate them with existing ones. Learn more. Web form: Embed a customizable web form widget on your website that will help your customers fill out a form with the details you need and submit their questions as tickets. A multichannel help desk makes it easy for your customers to reach you. It needs to be easy for your agents to use as well. A prolonged and complicated setup process will leave your agents struggling to navigate the system and end up delaying your customer service. Good ticketing software can be set up in minutes, and makes using it the least of your agents' troubles. When a customer submits a ticket, it needs to be routed to the right department or person. While this process can be done manually, it increases the risk of delays. 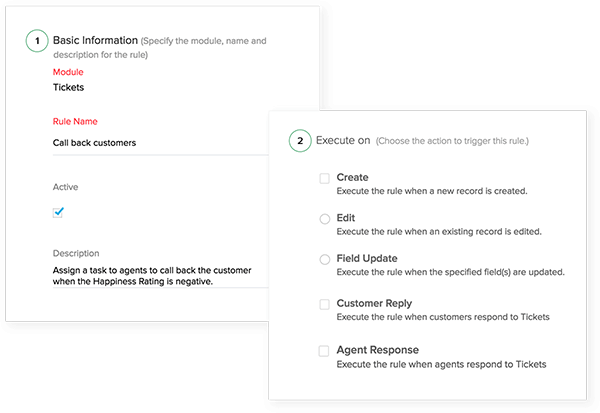 Automating this process helps your team resolve each issue faster. A round robin setting can also help distribute the ticket load evenly to reduce any bottlenecks. Your agents deal with a lot of customer requests, and it is imperative for them to know which tickets need their immediate attention. Automatic sentiment analysis helps agents prioritize and work on tickets that have a negative sentiment analysis, and gives them more context at the first look. The ticketing system identifies keywords in the customer's request and pulls up the relevant articles from the help center. 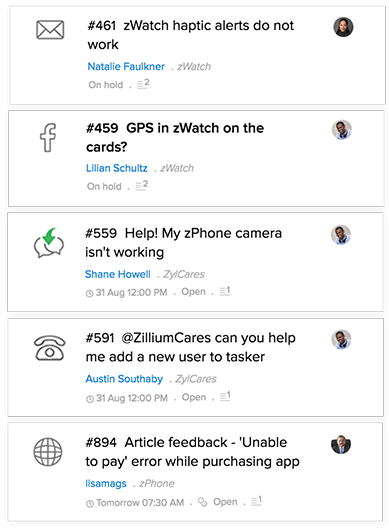 These automatic suggestions appear within the same workspace as the tickets and help agents answer and resolve simple issues a lot faster. Supplement your customer service efforts with powerful help desk software. It's imperative for a system to accomodate other teams and apps too. 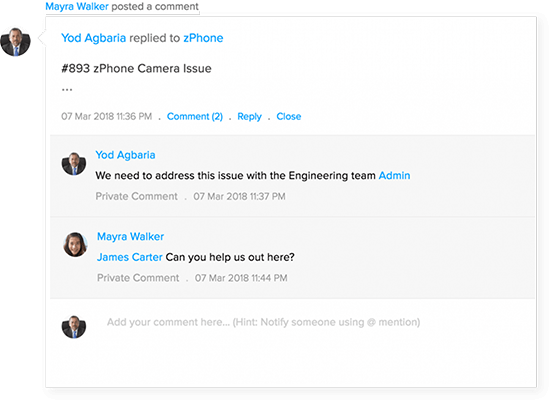 Coordinating with your engineering team to fix bugs, or your sales and marketing teams for additional information is essential to quality customer service. Your support reps need to keep tabs on all of these conversations and make sure there's no miscommunication between any of them. 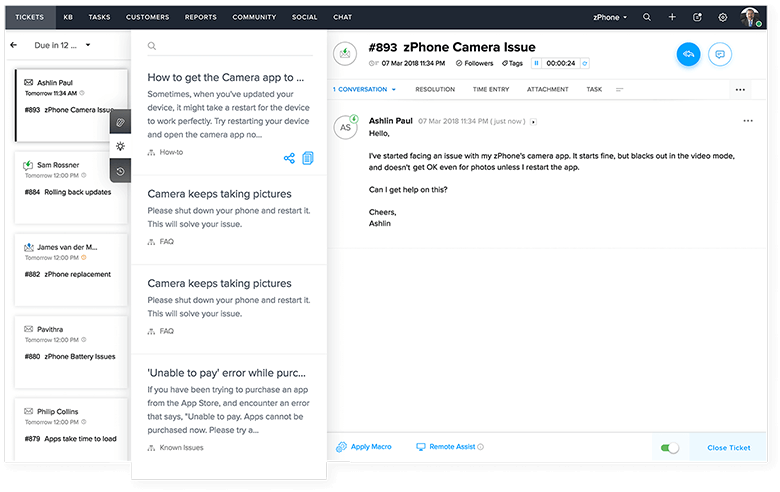 With a good ticket tracking tool, you can ensure all team conversations are streamlined, through a team feed where your employees can see all important announcements or through team chats where conversations are private and organized. Most ticketing tools come with agent collision prevention measures that alert an agent when someone else is working on the same ticket. This reduces the chances of overlapping work and confusing the customers. Each agent must be comfortable with the interface that they regularly work with. A flexible ticketing management system allows them to customize and integrate it with other apps they need. There is something only your customer can provide, and that is feedback. With a ticket management system, you can organize and analyze this data. 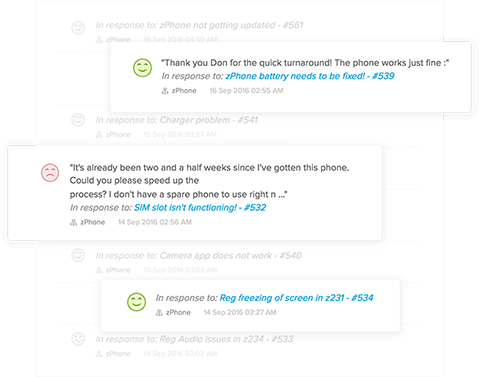 Set up your help desk and get the feel of how these features can help you. There's more to customer service than agents and customers. Managers play an important role in identifying areas for improvement. No matter how flexible the organization, when it comes to customer service, it's essential to stay consistent. 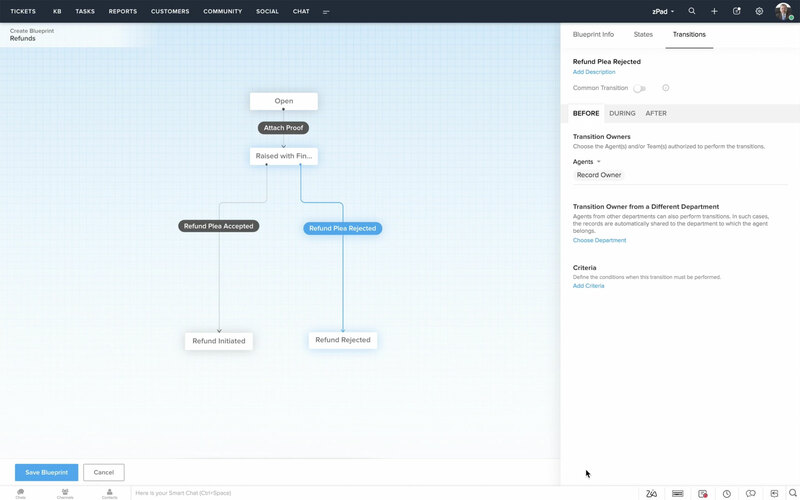 With advanced process automation, you can set up all your internal processes within your help desk, implement them automatically, and make sure that all processes are followed precisely, every time. An enterprise ticketing system also helps you spot bottlenecks that are causing delays in your support process. Using detailed reports to understand your team's performance helps managers understand where they need to improve and how they can remedy those issues. With a good trouble ticketing system, managers can even schedule reports to their inbox on a regular basis. Customer service does not have to mean being tied to your desk 24/7. Helpdesk software apps let you perform most ticketing functions from your mobile phone. So managers can help their agents and customers without needing to be present in an office. What if you end up not liking the help desk tool after you buy it? There are a lot of options to choose from when it comes to the ticket management system, and almost all of them come with a free trial period or an open source version, including Zoho Desk - one of the industry's leading help desk software solutions. You can evaluate and compare Zoho Desk with its contemporaries, take a look at pricing plans, and arrive at a decision yourself. It's definitely worth the effort. What is a multichannel ticketing system? What is issue tracking software? How to collaborate with multiple departments in your organization?